-Albany begins the week with a 23-22-4-5 record and 55 points. They stand in 4th place in the Northeast Division and 12th in the Eastern Conference. Looking at the first Playoff Primer of the season, released last night, the boys have some work to do to catch up. -With Scott Clemmensen staying up top with the parent Devils to backup Cory Schneider this weekend, Maxime Clermont was summoned back from Orlando yesterday. With another 3 in 3 weekend looming, I would not be surprised to see him get at least one start. Where: Onondaga County War Memorial at Oncenter, Syracuse, NY. Season Series: Syracuse leads 5-0. -After a disastrous Valentines week, the Crunch rebounded nicely with a 3 game sweep of last weekend’s games, catapulting them to the top of the league standings. A one goal loss to Rochester has them tied with Oklahoma City for the league’s best going into this weekend. -Tonight marks the start of a 3 game homestand for the Crunch, who host Utica on Saturday and Portland next Friday. -Goaltender Andrei Vasilevskiy made a one game appearance on Wednesday after coming down from Tampa, only to lose 4-3 to Rochester before being recalled. Watch: TWC Sports is carrying the game (Albany channel 50/323). Season Series: Hershey leads 3-0. -Hershey is riding a modest 2 game winning streak heading into a 3 in 3 weekend of their own, traveling to Binghamton on Friday and hosting Lehigh Valley on Sunday afternoon. -Things got a little heated on Saturday night against Bridgeport…as a result, forward Liam O’Brien was suspended for 3 games, the last one coming on Saturday. -At the start of the weekend, the Bears sit just one point behind Syracuse for 1st in the conference (and first overall in the league). Season Series: Binghamton leads 1-0. -After hosting Hershey on Friday evening, the B-Sens embark on a 4 game road trip, starting in Lehigh Valley on Saturday before coming to the Capital Region on Sunday. They finish the trip in Norfolk the following weekend. -2015 has not been kind to Binghamton, as they have had two separate 5 game winless streaks since the start of the calendar year and have fallen to the bottom of the East Division standings, tied with Norfolk for last place. -Albany returns to home ice for the first time since February 15th. After only having two home games for all of February, the Devils will have 7 of their next 11 games at the Times Union Center. Another 3 in 3 weekend has come and gone, and the February struggles continue. But at least there was finally a win, and maybe some signs of life, albeit too late, in another game. Friday: With most everyone back healthy and in the lineup, Mike Keenan and Alexandre Carrier were reassigned to Orlando. Keenan started out on a PTO in early December and played himself into an AHL deal. In 20 games he had one assist and finished a -3. Carrier appeared in 12 games and was scoreless, but did have two fights against former Devils (PL3 and Matt Corrente) under his belt. 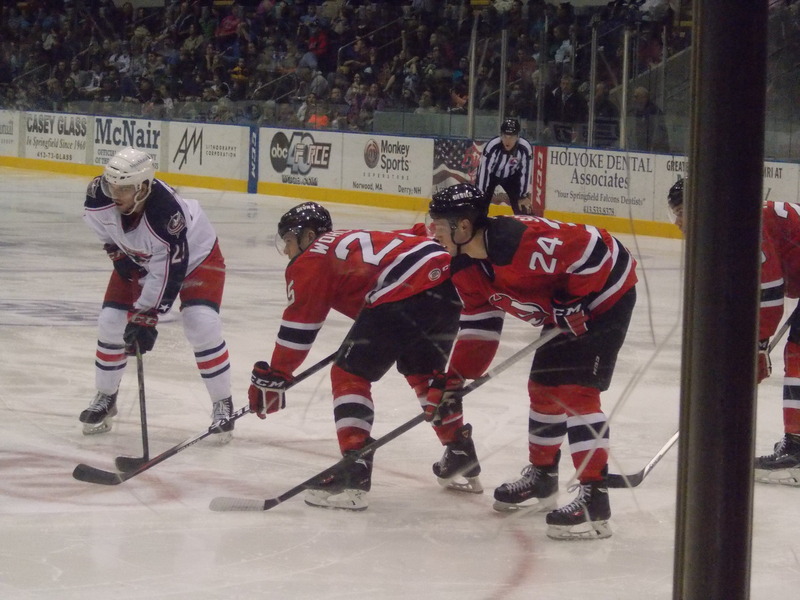 The road trip began west down the New York State Thruway, as Albany made its third visit of the season to the Oncenter to take on the Crunch, who was also in the midst of a 5 game winless streak (but had three OT loss points to show for it). Yanni Gourde would get the hosts on the board first with a tip in past Scott Wedgewood midway through the first period. Jonathan Marchessault would double the lead early in the second period when he managed to drag the puck past Wedgewood and into the net. But there was good news this period…an actual power play goal from Albany! Kelly Zajac finally scores his first of the season to cut the lead in half. But that would be as close as they would get, as Vladislav Namesntnikov would capitalize on a turnover and score alone on a breakaway to make it 3-1, pushing the losing streak to six games. Wedgewood stopped 21 of 24 shots, including a few spectacular saves, but it was not enough as he took his 12th loss of the season. Paul Thompson and Brandon Burlon had helpers, while Cam Janssen returned to the lineup for the first time since mid January. The middle game of the weekend saw the Devils make their only visit of the season to Utica to take on the Comets. Utica got on the board first midway through the opening period on a Brandon DeFazio goal. 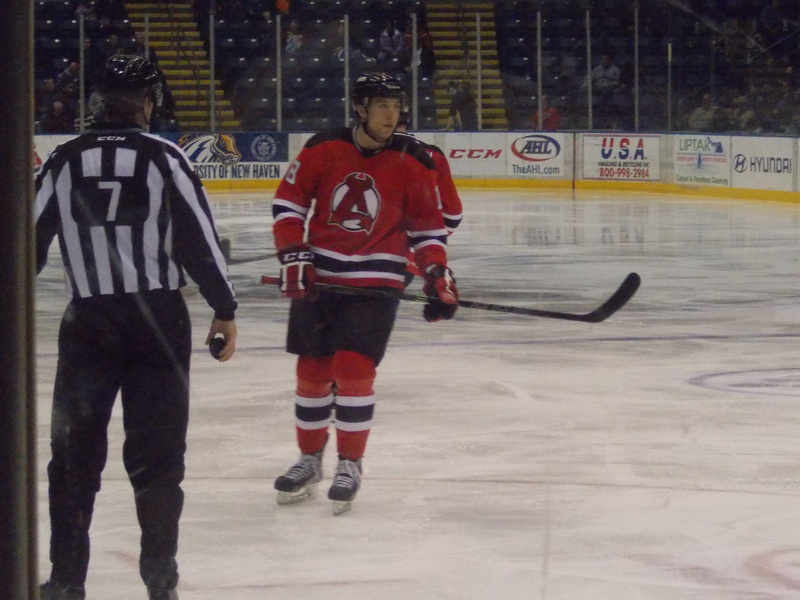 Albany caught a break later when a second Comets goal was disallowed due to an offsides call. And that would be a game changer…Ben Thomson would tie the game up at 1 late in the second period with his 7th of the season. Reece Scarlett would break the tie early in the third with his second of the season. Despite being outshot 10-4 in the third, Albany would manage to hold on for the win, breaking a 6 game losing streak and extending their win streak against Utica to 6 games. Scott Clemmensen picked up his 5th win and first since beating Bridgeport in Newark exactly one month earlier, stopping 31 of 32 shots. 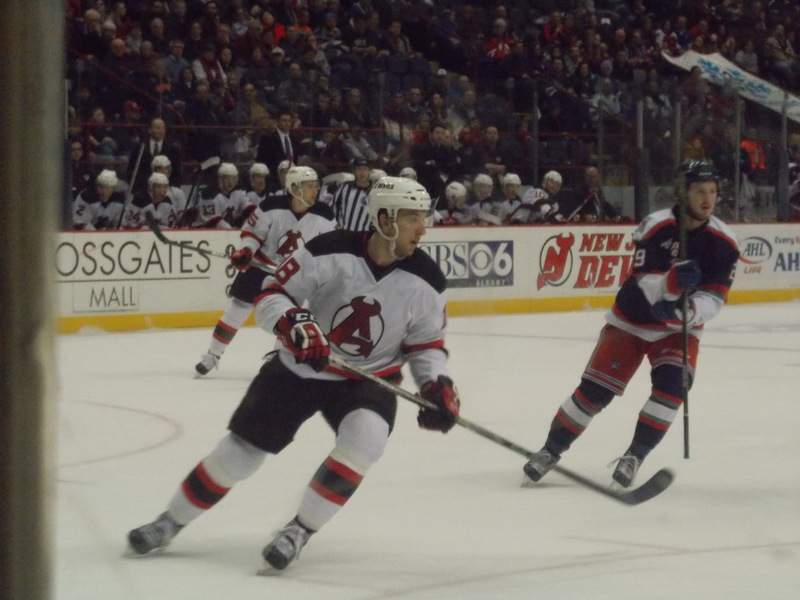 Thomson and 3 other Devils each had assists. *Since I was in New Jersey and didn’t see the game, the last two lines are at best a guess. A total of 80 combined penalty minutes were handed out as a result, mostly game misconducts from abuse of officials. Albany reached two season highs: penalty minutes (77) and shots (41). 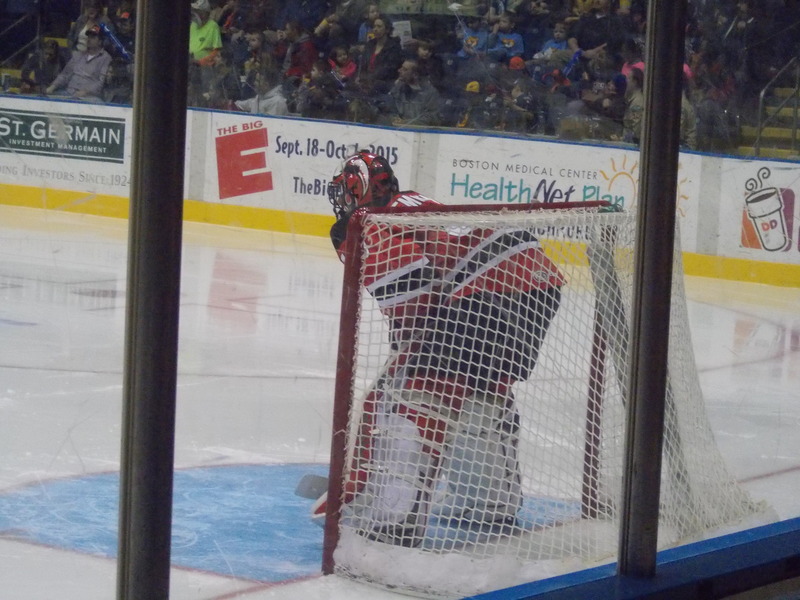 Scott Clemmensen started in back to back games and stopped 17 of 21 shots. Four different Devils had assists. Monday: With Keith Kinkaid getting injured halfway through Saturday’s win over Carolina at The Rock, Scott Clemmensen was recalled to New Jersey to play door man…er, back up Cory Schneider under emergency conditions. Pop Quiz: Who holds the Albany AHL record for most penalty minutes in one season? The answer is coming up. Very happy to finally see Kelly Zajac get on the board twice this weekend. 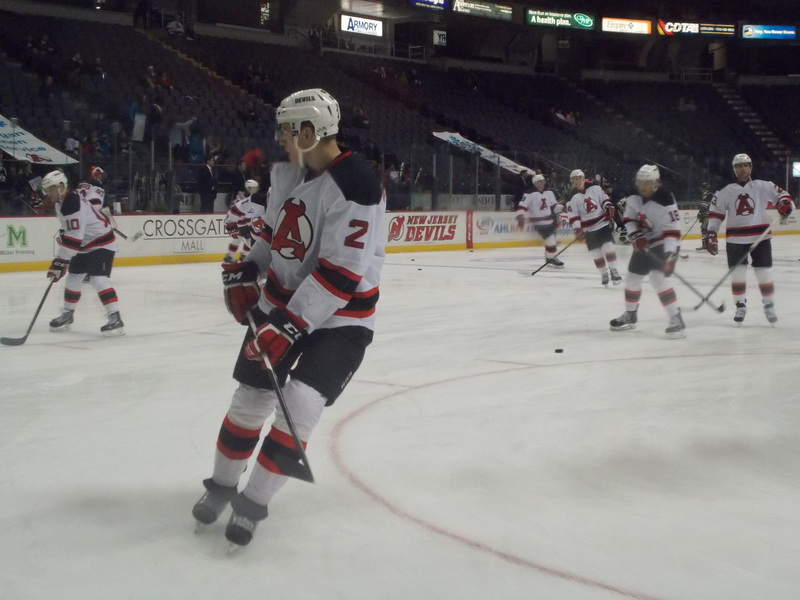 It’s been a lost season for the third Zajac brother, good to see him back and contributing. Maxime Clermont (Orlando): 12 GP, 6-4-0, 3.63 GAA, .877 Save Pct. Last one standing is Scott Timmins (lower), he is expected to return this weekend. 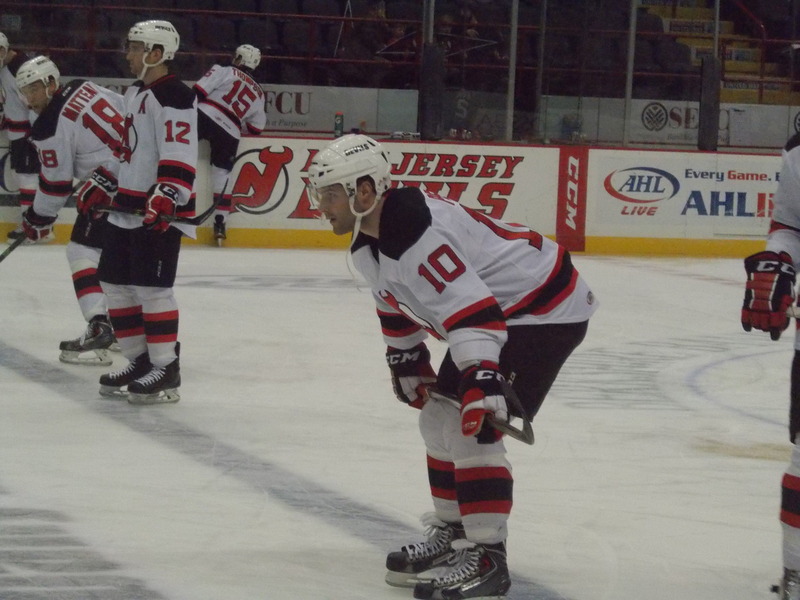 Darcy Zajac did sit out Saturday and Sunday, not sure if injury related or not. As if the month of February wasn’t already punishing…another 3 in 3 weekend to close the month out is up next. Friday it’s one last visit to Syracuse to take on the now league leading Crunch. Saturday they travel south on Interstate 81 to pay Hershey one last visit. Then the month of March kicks off on home ice, as Binghamton visits for the first time all season. Also back next weekend: conference seeding updates! Pop Quiz Answer: The man with the most penalty minutes in one season while wearing an Albany uniform? It was Matt Ruchty, who set the record during the River Rats Calder Cup winning 1994-95 season with 348 minutes. Pierre-Luc Leblond holds the Lowell/Albany franchise record with 334 in the 2010-11 season, incase anyone was wondering. -Albany begins the week with a 22-20-4-5 mark and 53 points. They stand in 4th place in the Northeast Division, 11th in the Eastern Conference. Despite the recent woes, they are still 5 points behind Worcester for a playoff spot. -It appears Cam Janssen will be rejoining the lineup this weekend after sitting out nearly a month with an upper body injury. Scott Timmins has finally resumed skating with the team, but he will likely not return until next weekend. Where: Onondaga County War Memorial, Syracuse, NY. Season Series: Syracuse leads 4-0. -Syracuse is winless in their last 5 games, but managed to get overtime loss points in 3 of those 5 games, maintaining a 3 point lead over Springfield and Hartford in the Northeast. -The Crunch only managed to score one goal in 3 games last week, resulting in an embarassing 10-0 loss to Adirondack on Tuesday and a 2 game weekend sweep in Norfolk. -All four victories over Albany this season have been by one goal, with three of the four games going beyond regulation. Where: Utica Memorial Auditorium, Utica, NY. Season Series: Albany leads 1-0. -The Comets are coming off a 1-1 week, where they split a home and home series with Rochester. -After dropping a 7-5 decision to Hamilton on the road Monday afternoon, Utica kicked off a 5 game homestand on Wednesday with a win over Texas. They host Toronto on Friday evening before the Devils arrive. -Unless Albany can make a run and end up in the Calder Cup Final, this will mark the last game outside the Eastern Conference this season. So far they have won 2 of 3 (with the lone loss to Adirondack at home on December 7th). Where: Mass Mutual Center, Springfield, MA. Season Series: Albany leads 3-2. -In the five game series played between both teams, the home team has won all 5 times. -The Falcons are in the middle of a 7 game homestand, beating Providence in overtime on Valentine’s Day, then losing in overtime to the Phantoms on Sunday. They host Hartford and Portland on Friday and Saturday before the Devils come in. Extended album as always over on the Facebook page. The February flop continues. 3 games, 3 days, 3 straight losses. But at least players are getting healthy…and someone other than Mike Sislo can score a goal. Baby steps! 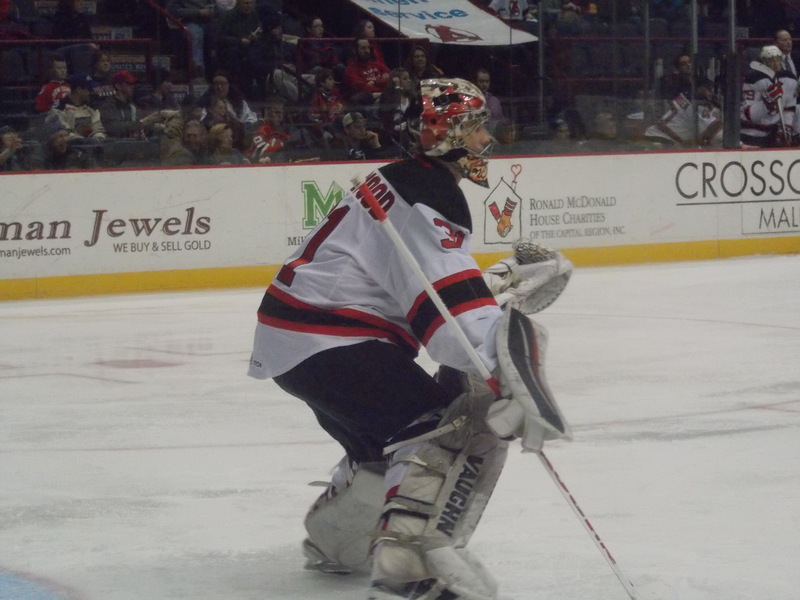 Friday: Albany is back down to two goaltenders on the roster as Maxime Clermont was reassigned to Orlando. He did very well since his recall on Christmas Eve, going 4-0 with a 1.94 GAA and a .921 save percentage. He is also the only goalie to win a shootout this season. After a 7 day layoff, it was back to work to start a 3 in 3 weekend, hosting the Bears on home ice. The game marked the return of four players from injury: Raman Hrabarenka (out since late November), Graham Black (out since early January), Kelly Zajac, and Rod Pelley. And Tim Sestito was back skating after a scary moment last Friday in Springfield. It was a relatively uneventful first period…Albany outshot Hershey 12-8 and managed to kill off a 5 on 3 Bears power play chance. Albany had a golden opportunity to get on the board early in the second thanks to a full 5 on 3 power play early in the second. But the special teams continued their recent struggle, not getting anything past Bears goaltender Philipp Grubauer. Stanislav Galiev finally broke the scoreless tie 13 minutes into the second period for a 1-0 Bears lead. Albany tried to get the equalizer, but simply could not get anything past Grubauer, and were shut out for the 5th time this season. Scott Wedgewood was feeling like Cory Schneider in net, playing very well but getting stuck with the loss, stopping 26 of 27 shots. The Devils also amassed a season low 4 penalty minutes, all in the first period. 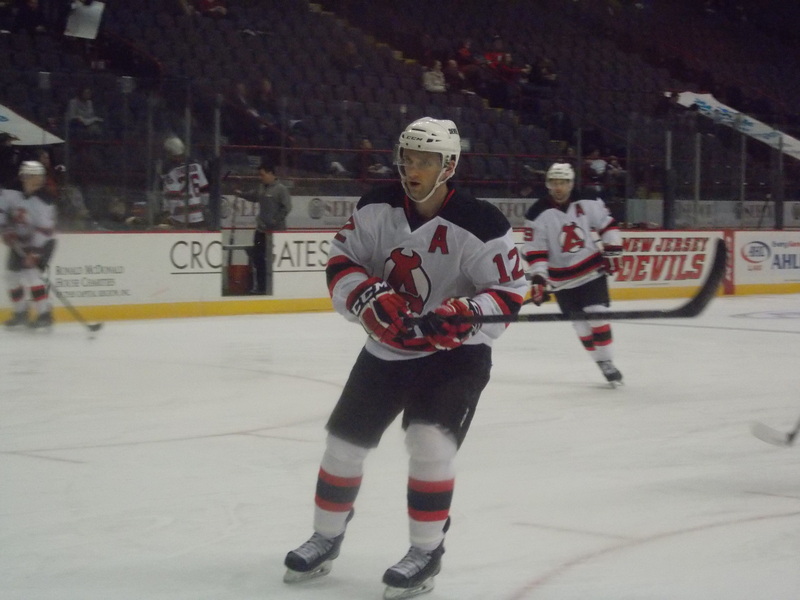 It was off to Connecticut’s state capital for the first time since December as Albany kicked off a Valentine’s home and home weekend series with the Wolfpack. Mike Sislo finally broke a cold spell for the special teams play, scoring on a power play in the first to get the Devils on the board. With Joe Whitney serving a cross check call (one of 5 Devil penalties called in the first alone), Rod Pelley became the first Devil other than Sislo to score a goal in February, getting one shorthanded for a 2-0 lead. But all those calls would catch up to Albany, as the Wolfpack got on the board late in the first with a Chris Mueller power play tally. Hartford would tie the game up midway through the second on a Danny Kristo goal. The game stayed tied and very tight…until 5 minutes left in the third period, when everything for the visitors would just fall apart. During a full 4 on 4, Tyler Brown and Mueller would score 18 seconds apart to give the Wolfpack their first lead of the night. Kristo would add an empty netter with 1:15 remaining for the exclamation point, giving Albany their fourth straight loss. Up until that last 5 minutes, Scott Clemmensen played great in net, but would get tagged with the loss in stopping 26 of 30 shots. Darcy Zajac had the lone helper. Roughly 17 hours after the final horn in Hartford, the two teams resumed the home and home series, this time in the Capital Region. Hartford got on the board twice in a 13 second span in the first, as Danny Kristo and Conor Allen each scored on Scott Wedgewood for a 2-0 lead. Mike Sislo would continue his hot February with his 13th goal less than 3 minutes later to cut the lead in half. But Ryan Bourque would restore the two goal lead just over a minute after that. Paul Thompson would score his 23rd (and first goal since January 24th) to make it a 3-2 game. Albany thought they tied the game early in the third, but after a video review it was believed the shot off Seth Helgeson’s stick hit the iron. But Sislo would come through again, tying the game up with his second of the day. Just as it looked like this game could go into overtime…not to be. Chris Mueller would score the game winner with 3:47 remaining in regulation, giving Hartford the weekend sweep and extending Albany’s losing streak to 5 games. Wedgewood stopped 19 of 23 shots in taking the loss. 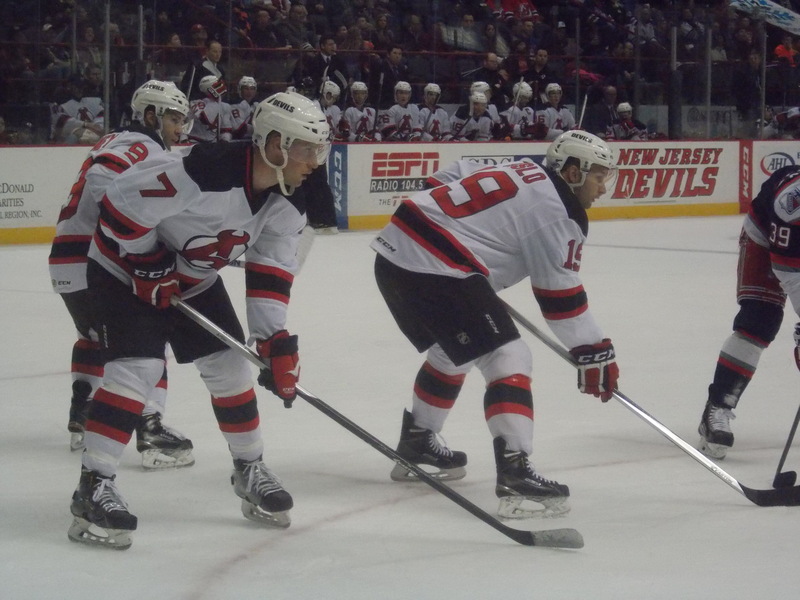 Joe Whitney added two assists, while Kelly Zajac and David Wohlberg each had a helper. Pop Quiz: What is the Albany AHL record for most times shut out in a season? Stay tuned for the answer. Apparently again Mike Sislo seems to be the only goal scorer this month, adding three more to his season total and moving up the franchise career list. He is now tied with Tim Sestito for second with 59, but it may take awhile to catch Joe Whitney, with 80 and counting. Maxime Clermont (Orlando): 10 GP, 5-4-0, 3.69 GAA, .874 Save Pct. Injury Update: After the weekend, only two remain on the indefinitely list: Scott Timmins (lower) and Cam Janssen (upper). The month of February is not going to get any easier for this group, as they begin a 5 game road trip, starting with another 3 in 3 weekend. Friday night they travel to Syracuse to take on the suddenly slumping Crunch. Saturday night they make their one visit on the season to Utica to face the Comets. Then a quick turnaround and back east to Springfield on Sunday afternoon to face the Falcons. And I will be making my return to New Jersey for the Carolina game on Saturday! Pop Quiz Answer: The record for most times shutout in a season? It’s the 2003-04 River Rats, who were shut out 13 times. The top 5 leading scorers that year, incase you’re wondering: Craig Darby (69 points), Steve Kariya (48), Joe Hulbig (45), Jiri Bicek (30) and Tuomas Pihlman (29). Remember them? 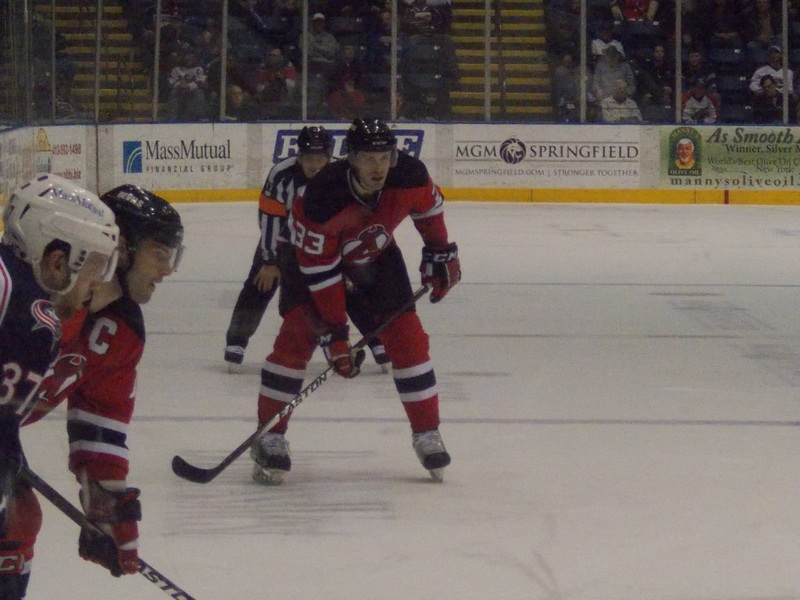 The Lowell/Albany franchise record stands at 8, the 08-09 Lowell Devils and in 2012-13. Fun fact: the 09-10, 98-99, and the Calder Cup winning 94-95 teams were only shut out once the entire regular season. -Albany begins the week with a 22-17-4-5 record and 53 points, standing in 4th place in the Northeast Division. They currently sit just outside the playoff picture in 10th, but are only two points behind 7th place Worcester and 8th place Portland for the last Eastern Conference spot. -It appears all but two players will be available for the weekend slate, which could be the first action for Graham Black and Raman Hrabarenka in quite some time. Scott Timmins and Cam Janssen are both still out. Season Series: Hershey leads 2-0. -The Bears begin the weekend winners of 8 out of their last 10, with just an OT loss to Lehigh Valley on Sunday and a shootout loss to Syracuse on January 31st their only blemishes. -Hershey just reached a franchise milestone: rookie Connor Carrick scored the team’s 20,000th regular season goal in Allentown two weeks ago. This is a mark only one other franchise has accomplished: the Montreal Canadiens, who reached the mark in March 2013. Where: XL Center, Hartford, CT (Saturday); Times Union Center, Albany, NY (Sunday). Season Series: Hartford leads 3-2. -Hartford returns home after a two game trip north to St. John’s earlier this week, where they were swept by the IceCaps but managed one standings point from a shootout loss. -The Wolfpack are looking to snap a 4 game winless streak after ending January on a strong note with a pair of victories over Bridgeport and Springfield at home. 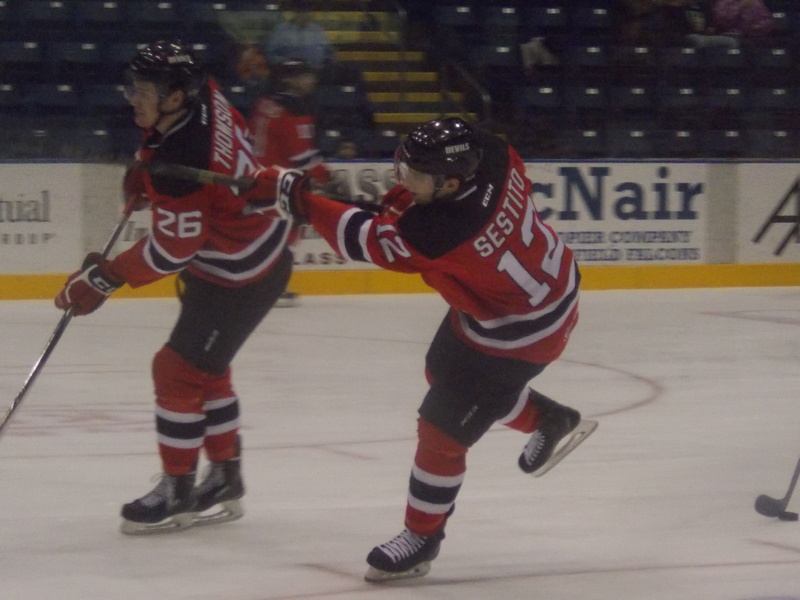 -With Mackenzie Skapski getting recalled to New York to fill in as backup, the current starter? 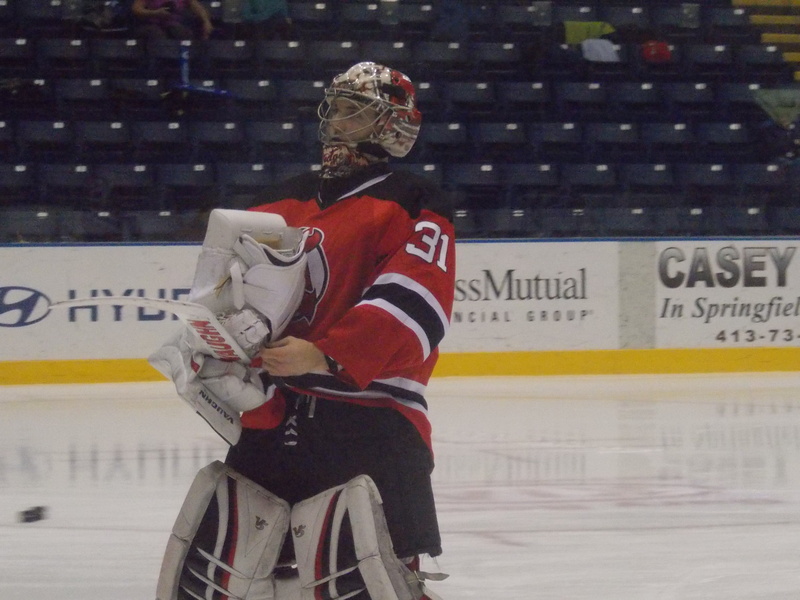 Former Brodeur backup Yann Danis, who already spent time in Norfolk earlier in the season before coming to Connecticut.